How To Grow Jade Plant.. Originally from Africa, the Jade tree is a fleshy, softly woody shrub or small tree up to 3m. 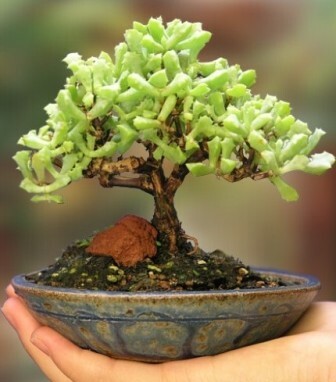 The Jade has a thick trunk and a fine branch structure with thick oval green succulent leaves. During autumn sometimes small white flowers appear, but only when the tree has experienced droughts in the season. The bark is green and soft when young, becoming red-brown when it ages. 1. A great choice for both high and low light conditions, the Jade tree is a great low-maintenance Bonsai choice. 2. Best grown indoors where it can get plenty of natural sunlight. 3. Only light watering require. 4. Mist occasionally with a spray bottle too. 5. Allow the soil to dry before removing roots or branches. 1. It is best to allow the soil to become dry between each watering which will depend on the time of year, how much humidity and amount of sunlight it s getting. 2. Feed each week or two (maybe less) with a weak or diluted liquid fertilizer. 3. Fertilizer made for succulents may be your best bet. 1. Allowing too much water to sit at the bottom of the pot with the roots will cause them to rot. 2. Avoid high strength type fertilizer. 3. Don’t add urea to the fertilizer.